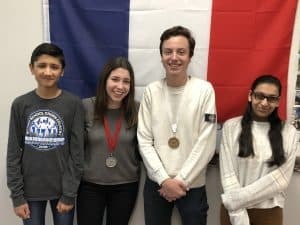 This year, dozens of international and local students, attending Burnaby Mountain Secondary School, participated in the annual district French public speaking contest – Concours d’Art Oratoire. Study in Burnaby would like to congratulate all the participants for their amazing efforts and dedication! We would also like to applaud Bianca & Filippo, two Italian International students enrolled at Burnaby Mountain who each won medals at the competition. Masih Mohammad-Rafi, Bianca Pizzirani (Silver), Filippo Miniati (Bronze). Ariana Esmail, and Nicholas Tsap (Gold) – missing. The Concours d’Art Oratoire is the biggest annual French public-speaking competition in Canada and involves close to 10,000 students around the country every year. The competition is organized by Canadian Parents for French (CPF) and aimed to stimulate the interest of students learning French and improving their speaking skills. Concours is open to French Second Language and Francophone students in grades 6 to 12. The competition has different categories for students; Core French, French immersion, and Francophone students. Thousands of students compete at the school and district levels, with winners moving on to the provincial finals where they compete in a one-day event. Grade 12 gold medal winners, from the provincial stage, will go on to compete in the national finals in Gatineau, Quebec. Speeches are judged by French-speaking volunteers, which usually include native Francophones, university professors, teachers, and French immersion graduates – many of whom competed in the Concours d’Art Oratoire themselves in previous years. French Immersion provides students with a chance to learn a second language. Any child, whose first language is not French, residing in Burnaby may apply to enter the French Immersion program. Students can enter the French Immersion program in kindergarten (Early Immersion) or grade 6 (Late Immersion). Learn more about French Immersion Programs in Burnaby, BC!